A new �135,000 funding package to restore an area of blanket bog in the Highlands which had been planted with conifers has been announced by Scottish Natural Heritage (SNH). The money in the form of a grant to the Royal Society for the Protection of Birds (RSPB) will be used to restore the forest block to blanket bog in an area of Caithness west of Altnabreac, 23 miles west of Wick. The support is part of a special funding package granted to SNH by the Scottish Executive this year. The conifer plantation is being removed due to its damaging impacts on the underlying blanket bog and potential effects on adjacent peatlland which is of international importance. Originally planted in the 1980s, the 148-hectare forest block known as Sleach has just been bought by the RSPB which plans to start tree felling this month. At the time, drains were cut into the deep peat prior to tree planting. 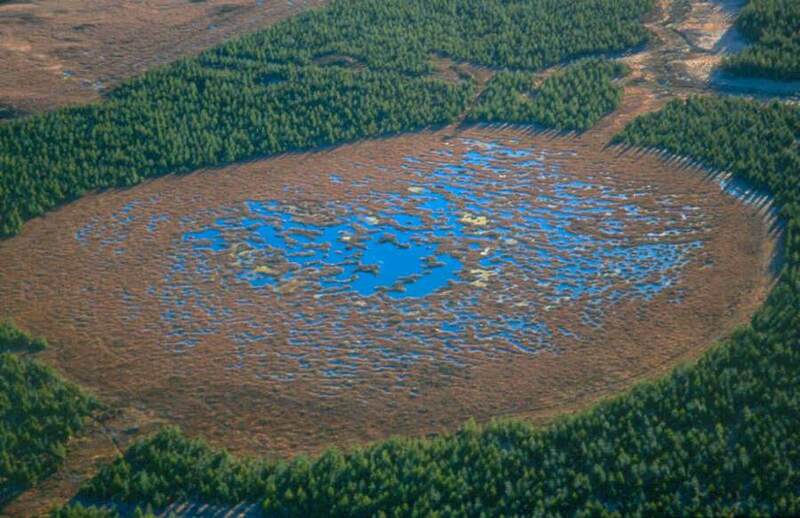 In addition to the damage caused by the drainage, the growing trees dry out and further damage the peatland habitat. This work is one of the first successful outcomes under the "Peatlands of Caithness & Sutherland Management Strategy 2005-2015" launched at Forsinard last year by Deputy Scottish Environment Minister Rhona Brankin. Blanket bogs are a priority habitat for conservation under the EU Habitats Directive. They are also home to many bird species protected under the Birds Directive. Much of the surrounding area is designated as Sites of Special Scientific Interest (SSSI), Special Areas of Conservation (SAC) and Special Protection Area (SPA). the LIFE Nature fund, has been actively removing forestry blocks in the area. The Sleach purchase will also join RSPB's Forsinard Estate in Sutherland to its Dorrery Estate in Caithness. said: "We are investing to protect Scotland's natural resources and its rich and diverse mix of wildlife and habitats. "I am delighted to see the Caithness and Sutherland Peatlands Management Strategy beginning to bear fruit through the allocation of additional funding from the Scottish Executive. "The Strategy is the product of a long term vision for this very special area of international importance and is an excellent example of partnership working making a real difference in conserving Scotland's rich biodiversity." SNH Area Manager Lesley Cranna said: "We are very pleased to announce this funding package which will allow RSPB to complete another part of an ambitious peatland restoration programme. "The LIFE peatlands conference held in Thurso last week recognised the achievements of the past 10 years, however there is still much to be done. This is an excellent start to the next phase of work. "Implementing the management strategy will require a partnership approach from a wide range of agencies, voluntary bodies and individuals, and we are pleased to see RSPB taking the lead on this project. "The felling and restoration of this block is just like slotting in an important piece into the peatland jigsaw. It takes us nearer to our goal of re-establishing a healthy peatland ecosystem." Dr Pete Mayhew, Senior Conservation Manager with RSPB, said: "We are very grateful to SNH and the Scottish Executive for this funding package. "The blanket peatlands of Caithness and Sutherland are of world importance and restoring them to their former condition is a huge job. This sort of partnership between Government agencies and private organisations is essential in realising this important work."